I would imagine that if you are a machine embroidery enthusiast you probably started out by doing embroidery by hand. Hand embroidery has a beautiful unique look that cannot be duplicated by hand. Hand embroidery thread, or floss as it is called is much thicker than machine embroidery thread so the look is much bolder. The stitches in hand embroidery are also usually longer and vary in length. The combination of long stitches and thicker thread are the main reasons for the unique look of hand embroidery. Modern digitizing software was created and designed to create perfect stitches. Designs are usually digitized by tracing a line and having the software automatically fill in the stitches. For our hand embroidery collections we do not use this technique. We have recreated the look of hand embroidery by using standard polyester thread and a unique digitizing process. The artwork is drawn with the actual stitches in mind and then hand digitized, stitch-by-stitch for amazing results. 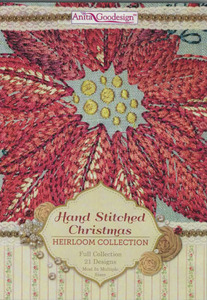 The Hand Stitched Christmas collection is no exception. Each of these designs were hand drawn and digitized with a 5-ply to a 7-ply stitch. When you embroider these designs you will really see the difference and you will love them. There are over 20 unique designs and most of the designs come in multiple sizes.